I wrote a post about entomophagy, people eating insects, a while back that talked about a few new ideas about eating insects, including one that has been pushed heavily by a group in the Netherlands: commercially farming insects for human consumption as a replacement for our current meat sources. I am intrigued by this idea, though I also don’t personally eat insects and I’m not entirely convinced that it is going to work. But, I’ve already written about that topic and I don’t want to rehash things I’ve already done. Today’s post is going to focus on a specific type of entomophagy: dragonfly entomophagy. Yes, that’s right! Many cultures eat dragonflies, and today I’m going to cover the importance of dragonflies in cuisine. Americans aren’t typically big proponents of eating insects, so it’s not surprising that we don’t find dragonfly nymphs or adults for sale in our food markets. That’s not the case in other parts of the world though! Dragonflies are eaten by many cultures, though they are most popular in Asian cuisine. 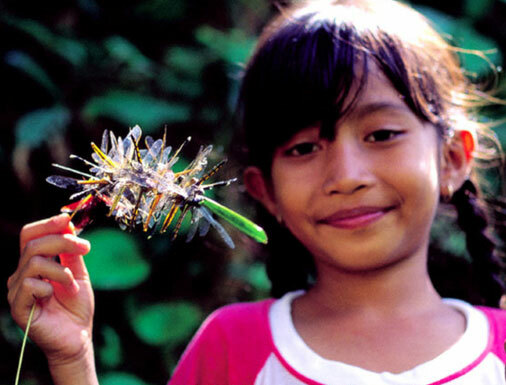 In many countries, especially in southeast Asia and Indonesia, dragonflies are available for sale in markets, intended for consumption by people. In Japan, a variety of aquatic insects are considered delicacies and can be purchased on skewers to be taken home to eat. Dragonflies are also popular in Papua New Guinea, where they are either boiled or skewered and roasted over a fire, and in the Philippines. In most parts of Asia, both the nymphs and the adults are eaten, typically boiled or fried and often served on rice. Dragonfly haul on Bali. Photo by Peter Menzel and made available on the NOVA website. Click image for source. Dragonflies seem to be especially popular as food on Bali in Indonesia. There, some people still engage in a traditional dragonfly hunting method that involves a bamboo pole tipped with a long strip of palm. The palm is coated in a sticky substance produced by the jackfruit tree and dragonfly hunters catch their prey by flicking the palm strip toward the dragonfly. If the strip touches the dragonfly, it sticks and the insect can then be transferred to another string to carry it home. This is, however, a dying hunting method. With the modernization of Indonesia and other dragonfly eating cultures, many of the traditional hunting methods are being lost. In the book Man Eating Bugs, the authors Peter Menzel and Faith D’Alusio recount a conversation with one Balinese man who could not convince his children to hunt dragonflies the way he used to as a child. They had enough money to buy food and had a television, plus it was too hot outside, so the kids couldn’t be bothered to catch dragonflies to eat. Fried dragonflies on rice. Click on image for image source. Whether captured by the people who intend to eat them or purchased from a market, dragonflies tend to be cooked in one of a few ways on Bali. The simplest method is to simply remove the wings and fry the dragonflies, usually in coconut oil. The same technique can be used on nymphs by popping them into the hot oil as is. The fried dragonflies can then be eaten plain as a snack, or placed atop rice to be eaten as a meal. Fancier preparations are made as well. Boiling wingless dragonflies in coconut milk seasoned with ginger and garlic is said to be especially tasty, giving the adult dragonflies a flavor somewhat reminiscent of soft-shelled crab. Not surprisingly, the aquatic dragonfly larvae are reported to taste more like fish and are sometimes cooked using the same methods. A young girl looks on in horror as her mother samples a dragonfly hors d’oeuvre. Click on photo for image source. While dragonflies are most commonly eaten in Asia, it’s not the only continent on which dragonflies are consumed. 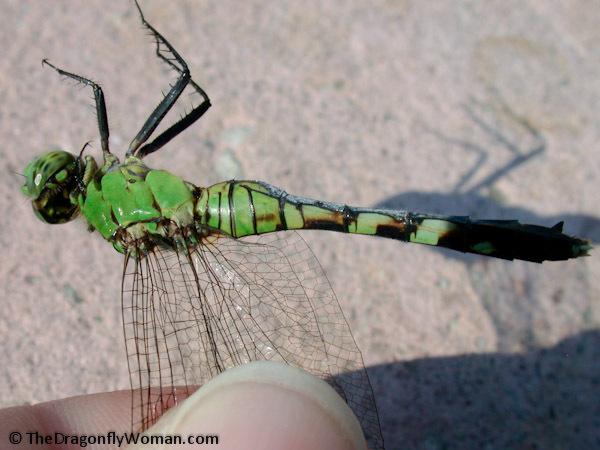 You can even try dragonflies right here in the USA! Just head to the Audubon Insectarium in New Orleans, where one cafe is dedicated entirely to sampling insect cuisine. One dish that has been served there features native dragonflies, eastern pondhawks, fried in Zatarain’s fish fry, settled on top of a sautéed mushroom, and drizzled with Dijon soy butter (on the plate in the image). You can even occasionally find dragonflies on the menu at the annual Explorer’s Club banquet, an evening of adventurous eating for members that can feature many insect dishes. Heat oil to 340-350 degrees F. Meanwhile, rinse the dragonfly larvae or adults and remove the wings from any adults being prepared. Make the tempura batter by mixing the egg, flour, ice water, salt, and pepper. Whisk together until smooth. When oil is hot, lightly flour the dragonflies and dip them into the tempura batter. Drop them into the oil immediately. Cook until brown and crispy. Serve promptly with soy sauce or Siracha. I personally think that if you’re going to eat tempura dragonflies then you should dip them in the tempura sauce made from soy sauce, mirin, dashi, and sugar that you get at Japanese restaurants. It is super tasty! Although I’m unlikely to sample dragonfly tempura any time soon myself, I imagine that tempura sauce would pair marvelously with this dish. I am sure there are more cultures that eat dragonflies and preparations I have missed, but this should provide a basic overview of dragonfly entomophagy around the world! So, who’s hungry for dragonflies?! Congratulations to my contest winner, Dave Stone of Things Biological, for suggesting this fun topic. Congrats Dave! A hearty thank you to everyone else who participated in the contest too. Even if you didn’t win this time, you might still see the topic you suggested here in the future. There were several excellent topics proposed, and I had a hard time making a final decision. Dave, I will contact you to get an address where I can send your loot. For everyone else, I’ll have another contest soon! Nice piece– thanks for sharing. I’m including the Audubon Insectarium’s dragonfly recipe (from its creator, Zack Lemann) in my revised and updated Eat-a-Bug Cookbook, to be released in July 2013. Excellent! I am very interested in seeing that recipe, so I will check out your revised book for sure. I don’t eat fish or shellfish or seafood, so I am unlikely to eat dragonflies myself, but that dragonfly recipe sounds particularly nice. Great topic! I’ve been fascinated by the consumption of dragonflies for the longest time, even though I don’t see myself trying it out anytime soon, either. I wonder what their nutritional value is, and compared to the other more common meat. Is it specifically that they don’t hunt dragonflies the traditional way in Bali anymore? Or is the cuisine not consumed as much? As I understand it, many people on Bali no longer have to rely on hunting to supplement their diets because the quality of life has improved, people are making more money, and no longer need to do things like hunting dragonflies to survive because they can buy the food they need. They don’t eat dragonflies as food as much because they have food alternatives that are easier to use. The younger generations have grown up in this environment, where dragonfly hunting is more of a hobby than a necessity, and their disinterest in continuing the practice is leading to the loss of traditional dragonfly hunting techniques. As for the nutritional content of dragonflies relative to other meats, I couldn’t find any specific information. However, insects are generally lower in fat, especially saturated fats, and higher in protein than things like beef, pork, and chicken when you compare them ounce to ounce. They’re supposed to be a healthy alternative to our current meat sources. I L O V E it! Can’t wait to share your entry with my students! It is going to take a little time for me to digest this post. Ha ha ha! Love it. I wouldn’t eat an insect. I know in Mexico they eat chapulines, they’re like grasshoppers, but no, I can live without trying them. Nice post! Have you had a chance to check out the black moth I photographed for you? I don’t eat insects either, though if I ever do I have the one I’m going to try first already picked out – the giant leafcutter ants from South America, the hormiga culona. In the US you can buy them dry roasted and I imagine they’re going to taste nutty and salty. Sounds like a good way to introduce myself to entomophagy! But I’m a very squeamish meat eater, so we’ll see if I ever actually do that. I thought I had left a comment on your post about the black moth, but maybe I forgot to actually send it or something! Fabulous moth! And I’m impressed you saw it hiding up there by the garage door opener. I’m not sure I would have seen it. Very interesting post… you almost made dragonflies sound delicious! I’ve tried water beetles and wasn’t very impressed, but most of those preparations actually sound, well… good! I can only hope that those kids who didn’t want to go hunt dragonflies were only a particularly lazy set of kids, because it’s not just Balinese culture that is precious and should be maintained, but also – isn’t flicking little sticky strings at huge gross bugs like, what being a kid is all about? Ha ha! Flicking sticky strings at bugs IS what being a kid is all about! Love it. And let me know if you ever try dragonflies. I’d love to get a first-hand report of their flavor.